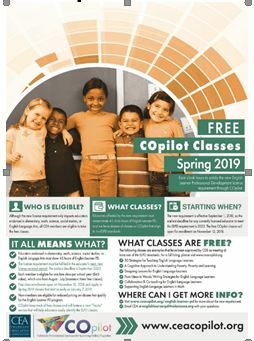 CEA is offering members up to three free COpilot classes to help teachers meet the new license requirement recently adopted by the State Board of Education. ESP and SSP members can get COpilot classes free as well. Email Casey Kilpatrick – ckilpatrick@coloradoea.org – if you have any questions about the new license requirement or free class program. If members have questions, please have them email englishlearnerpd@coloradoea.org – an inbox monitored by all CEA Teaching & Learning staff to be as responsive as possible to members with questions on this issue.